Washer Type. A Klingersil C-4401 washer is inserted between the stem and spud. 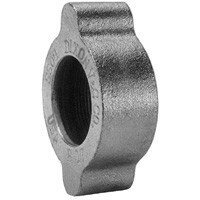 A leak proof seal is formed by rotating the wing nut and hammering it tight. Recommended for steam service up to 450°F. Easy to seal. Works with existing fittings. Plated steel and / or iron. Use with Boss Clamps.